Join us as we merge our external environment, the seaside village of Yelapa, a traditional Mexican community accessible only by boat, with the wild nature that lives inside us. By practicing yoga twice daily, eating nourishing food communally, and being next to the sea for seven days, we will awaken to our true nature: free, blissful, and wise. 11-5 Free time to swim, snorkel, read, hike, horseback ride, join a boat trip to a nearby island, etc. Deduct $200 from all prices if you register by 11/18/18. All rooms have full ocean views and access to a kitchen. $300 deposit holds your spot and qualifies you for early bird pricing, which ends 11/18/18. Payment plans available. To set up a payment plan, please register with the $300 deposit and we will follow up to schedule your remaining payments. If you would like to bring a partner who will stay and eat with us but not participate in the yoga program, please book a private single and $450 non-participating partner fee. Retreat includes: First night hotel accommodation in Puerto Vallarta and six nights of accommodation in Yelapa; round-trip boat transportation with group between Puerto Vallarta and Yelapa; fresh brunch and dinner everyday (dinner on first night, breakfast on last day); two yoga classes per day. 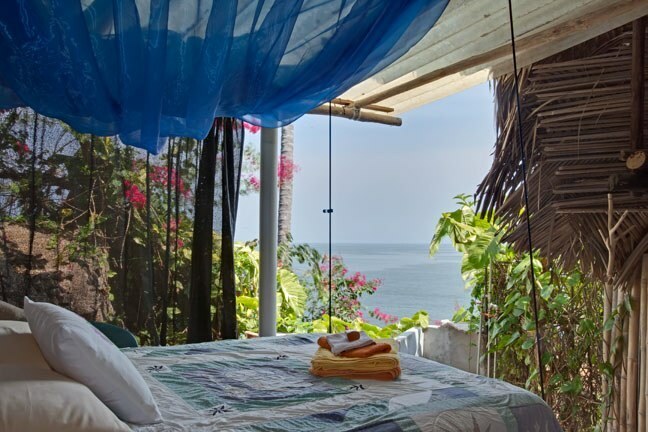 In Puerto Vallarta, we stay at Catedral Vallarta Boutique Hotel (or similar) and in Yelapa, we stay at Casa Isabel. Find reviews of Catedral Vallarta here and Casa Isabel here. Please book your flights early as this is the high tourist season. (It's also the best time to come as the weather is phenomenal and the insects are largely at bay.) Flights can be hard to come by and/or expensive if you book fewer than two months in advance. Yelapa is a rustic, adventure destination. There are many uneven steps between our rooms and common areas and the town itself. Foot paths are unpaved and uneven. Boat boarding and disembarking is usually done directly onto the beach. All are welcome, but please be prepared and know what to expect. We will help however we can, and please feel free to ask questions. Cancellation policy: Retreat payments are non-refundable and non-transferable for cancelations less than 45 days prior to departure. Retreat payments (minus $75 administrative fee) are transferable to another year's retreat if cancellation is made 45 or more days before departure. We highly recommend that students purchase travelers insurance.